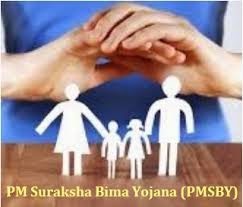 PMSBY is a one year cover Personal Accident Insurance Scheme which is renewable from year to year which will offer protection against death or disability due to accident. This scheme would be offered, administered through the Public Sector General Insurance Companies - PSGICs and other general insurance companies willing to offer the product. Participating Banks will be the master policy holders. Period of Insurance is annual from 1st June to 31st May. Premium Amount: The premium amount will be deducted from the account holder's savings bank account through auto debit facility. Persons having bank account linked with Aadhaar card number can give form to the bank every year before 1st of June in order to join the scheme. All person has to opt for this scheme every year. He can also prefer to give long term option of continuing the scheme and his account will be auto debited every year by the bank. To avail the benefits of this scheme visit camps and fill the forms and contact nearest bank branch or bank mitr, insurance agent immediately. Good post! I am glad that government has made some nice rules. Anyways, it is time to begin personal financial planning as want to save money and have a nice and secure future for myself and for my family. It was nice going through this post.